Here is a dainty little outfit for a precious little one. You will need 3 ounces baby yarn and a size 6 or (G) hook or size needed to work to gauge given below. SACQUE: Ch 63 for neck edge. ROW 1 : Dc in 4th ch from hook, dc in each st to end of ch. Counting ch as 1 dc there are 61 dc in row. Row 2: Ch 3 turn ( ch 3 always counts as first dc), dc in each of next 2 dc,*2 dc in next st, dc in each of the next 2 sts, repeat from * 18 times dc in top of turning chain–80 sts in all. Work 3 more rows of dc making 19 increases evenly spaced in next row and 20 increases in each of the next 2 rows. Be sure not to work an increase over an increase of preceding row. Counting turning chain as 1 there will be 139 dc in row 5. Row 6: On right side, ch 3, turn, *sk 2 dc, shell in sp before next dc ( to make a shell: 2 dc, ch 1, 2 dc in space), sk 2 dc, a raised dc( to make a raised dc: Thread over, insert hook from front to back in sp before next dc, bring hook around to front on next side of dc, thread over and work off lps on hook for a dc). Repeat from * 26 times, sk 2 dc, shell in sp before next dc, dc in top of turning ch. There are 28 shells. Row 7 : Ch 3, turn,* shell in ch lp of first shell, this row make a raised dc around post of next dc,working from back to front in this row. shell in ch lp of next shell repeat from * to * twice, a raised dc around post of next raised dc, sk 6 shells for right sleeve, repeat from * to * 8 times, a raised dc around next raised dc, sk 6 shells for left sleeve repeat from * to * 4 times, dc in top of turning ch. Row 8: Ch 3, turn, shell in next shell, working from front to back in this row, ( make a raised dc around post of next raised dc, shell in next shell) 3 times, a raised dc around post of 2 dc at underarm, continue across row in same manner, working a raised dc around post of 2 dc at other under arm. End with a dc in top of turning ch. There are 16 shells. Row 9: Ch 3, turn, shell in next shell, working from back to front in this row * make a raised dc around post of next raised dc, shell in next shell, repeat across, end with dc in turning ch. Row 10: Ch 3, turn, Shell in next Shell, working from front to back in this row* make a raised dc around post of next raised dc, shell in next shell, repeat across,end with dc in turning chain. Rows 11 through 15: Alternate rows 9 and 10, inc shells to (2 dc, ch1, 3 dc) in next shell. Rows 16, 17 and 18: Continue alternating rows 9 and 10, inc shells to (3 dc, ch1, 3 dc) in next shell. Row 19: Continue raised dc as before, making shells of 7 dc in this row. Fasten off. Sleeves: On right side, join yarn at underarm between 2 raised dc, ch 3, a shell of ( 2 dc, ch 1, 2 dc) in next shell, working from front to back * a raised dc around post of next dc, a shell in shell repeat from * around, end with sl st in top of ch 3. Work 7 more rounds in same manner. Now work a round with shells of 5 dc. Fasten off. Neck Beading: On right side, begin at right front neck edge, ch 4, sk 2 sts, dc in next st, * ch 2, sk 2 sts, dc in next st, repeat from * around neck edge. Fasten off. Steam lightly. Weave ribbon through beading. Rnd 2: Ch 3, * 2 dc in next dc, 1 Dc in next Dc, repeat from * around, sl st in top of ch 3— 36 dc in all. Rnd 3: Ch 3, * 2 dc in next dc, dc in each of next 2 dc, repeat from * around, sl st in top of ch 3—-48 dc in all. Pattern Row 1:: On right side, ch 3 working from front to back make a raised dc around post of next dc,* sk 2 dc make a shell of (3 dc, ch 1, 3 dc) in sp before next dc, sk 2 dc, a raised dc, repeat from * 6 times, end with dc in next dc after raised dc. Row 2: Ch 3 , turn, working from back to front * make a raised dc around post of last raised dc, dc in top of turning ch. Repeat rows 1 and 2 of pattern until there are 10 rows. Fasten off. Neck band: Fold back the last 2 rows of brim. On right side, make 42 sc evenly spaced on neck edge. Working through both thicknesses of folded portion, * ch 1, turn, sc in each sc. Repeat from * once. Beading: Ch 4, turn sk 2 sts, dc in next st, repeat from * across. Fasten off. Steam lightly. Weave ribbon through beading. Booties: Ch 30. join with a sl st in first ch st. Round 1: Ch 4, * sk 1 ch st, dc in next ch st, ch 1 repeat from * around, end with a sl in third st of ch 4. There are 15 sps which form the beading. Rnd 2: Ch 3, sk 1 sp, make a shell ( dc, ch 1, 2 dc) in next sp *, working from front to back make a raised dc around next dc, sk 1 sp, a shell in next sp, repeat from * working 1 shell in next to last sp, sl st in top of ch 3. Continue working shells and raised dc in same manner for 3 more rnds. Work a rnd of raised dc and shells composed of 5 dc. Fasten off. Instep: Fold cuff in half with end of last rnd at center back, mark 3 center front sps of beading. Join yarn in foundation ch at edge of first sp, work 3 sc in each of the three center sps. Ch 1, Turn. Work back and forth across these 9 sts until work measures 1 inch. Fasten off. Foot: Begin at center back on foundation ch, ch 3, work 10 dc to instep 8 dc along side of instep, 9 dc across instep 8 dc along other side of instep, and 11 dc to end, sl st in top of ch 3. * Ch 3 dc in each dc around sl st in top of ch3. Repeat from * once. Next rnd: Ch 3, work 3 sts together as follows* thread over draw up a lp repeat from * twice, thread over in next st, thread over pull through 2 lps repeat from * twice, thread over and pull through all lps on hook at once, dc in each of next 15 dc, (work 3 sts together as before) 3 times, dc in each of next 15 dc, dc in last st. Fasten off, leaving an end. Sew seam along center of foot. Steam lightly. Weave ribbon through beading. Chain 199 Dc in 7 chain from hook,* ch2, skip 2 chain, 1 dc in 3rd chain. repeat from * across row. Row 2: Chain 5, *sk 1 dc, shell (3 dc, ch 1, 3 dc) in next space. Skp 1 dc and 1 ch2 sp, do a raised dc around next dc ( to make a raised dc: Thread over, insert hook from front to back in sp before next dc, bring hook around to front on next side of dc, thread over and work off lps on hook for a dc repeat from * across row. ending with ch 2 ,dc in last dc. There will be 21 shells with a space on each end. Row 3: Chain 5, * shell in ch 1 of previous shell . working from back to front in this row do a raised dc on next dc.repeat from * across row. do a raised dc around next dc. repeat from * across row. Repeat rows 3 & 4 for 84 rows. Here is an addition to this pattern worked out by my friend Susan. 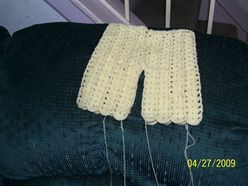 BLOOMERS with a 4.00mm-G Hook Chain 92. 2nd Row: Continue shell pattern for 10 rows. Row 11: Divide for legs: Fold piece in ½ and find center stitch & mark with safety pin or st marker. Continue next row same as row 10. Last row after leg division (20 total rows), make 7-dc shells instead (of 2 dc, ch 2, 3 dc). *No ch-1 sp. Fasten off after 10 rows. You now have a very wide pc of work. Putting the shell & raised st on the outside, fold from the Left and Right towards the center. Now you can see how it will look. Sew tog Left leg to division and Right leg to division. After both legs are sewn tog, sew the back sides together so they meet in the middle to the waist. Waist Band: DC around each st beginning from sewn center in back. Slip st together. Row 1: Double crochet around edge of waist. Waist Rnd 2: FPdc in 1st stitch, BPdc in next, and so on. & same for fpst. At end of row 3 OR 4, slip stitch waist band together. Fasten off. row from front around. Tie tog. You can also use ribbon to do the same, although ribbon does not hold up during wash.
Care: Either wash cold, dry on delicate cycle OR hand wash and lay flat. You will need to shape it while damp & you can do this by using towel beneath on ironing board to pin into place, or on table where it will not be moved. Anyway, hoping you can help my future endeavors, as I’ve begun crocheting for the children’s ministry in my church. I’ve not had much luck in finding/creating a website/page like you have. Can you share your talent in this area too? I have been keeping track of you on face book. If you are interested in making a web page just go to http://www.wordpress.com it is very user friendly and it’s free. Just found this page and I love it. Keep up the good work. Thanks Sherry for the kind words and for visiting my web site! Thanks Denise for visiting my website. so in the shawl,row2,,,the asrisk is missing…where does it go? After the chain 5* I have corrected it. I’m a bit confused on the foot. I’ve done first row ending with 11 dc and joining . then it says repeat from *once??? I’m sorry you are having a problem withe the bootie pattern. I have reviewed it and I’m also confused. I will look up the original pattern and get back to you as soon as possible.